Yet another New York Evening Graphic find, Laugh and Learn ran in 1926. What a shame that this is Kerry Conway's only newspaper cartooning credit. That art is absolutely top-notch. His anatomy and expressions are obviously not the product of an untrained hand, and I love the style, which seems to harken back to a look that was popular way back in the mid-19th century. Anyone know what happened to Kerry Conway? No luck on finding out what happened to Kerry. I did found out, though, that "Laugh and Learn" was apparently collected in a book format once, in 1930. Thanks extra much for the info on this book. It must be quite a rarity as there wasn't a single copy on ABE. I'll definitely have my eye peeled for it, though. 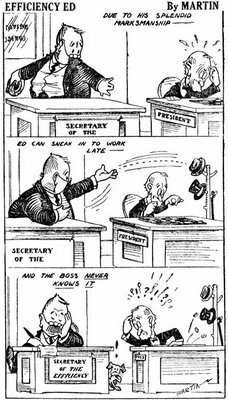 I guess if Conway had a book published in 1930, there must be more to the story than a short-run strip in the Graphic in 1926! 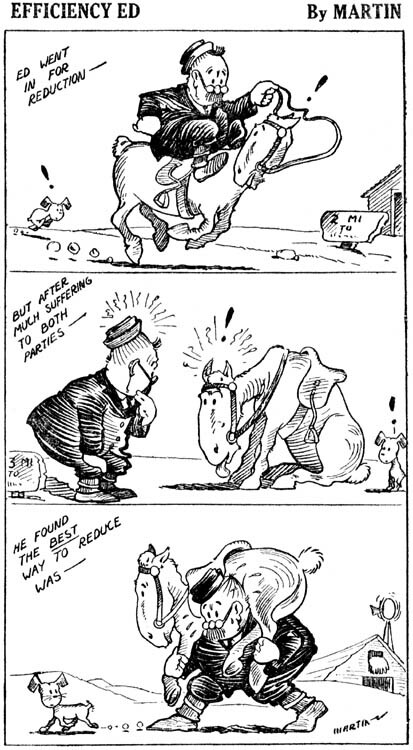 Here's a neat strip from 1922 called The Little Old Wise Man. It was sold in batches by Ad Art Service to newspapers that wanted to stimulate their classified ad sales. As you can see the wise man had an answer to all life's problems, and the answer was invariably to place a classified ad. Delightful art was supplied by Lawrence Redner. Hard to believe that anything by Harrison Cady could qualify as an obscurity, but yet here we are. The Jolly Jumpers Sunday pages were produced for the mysterious Publishers Press syndicate. I have found precious little information about this company, or it's manager C.J. Mar, to whom all the strips were copyright. I do know that Mar was in 1910 a manager of the Hearst Syndicate, and this new venture was I gather his bid to start his own newspaper syndication company. Publishers Press also seems to have gone by the name Western Newspaper Syndicate during its short life. 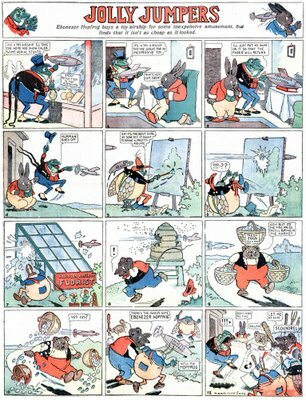 Whatever the name, the syndicate seems to have been started in July 1911 with just one strip - Zoo-Illogical Snapshots by Harold Knerr. Harrison Cady came on board with Jolly Jumpers on May 19 1912, at first signing the strip as Gordon Curtis. Cady soon dropped the nom de plume. Jolly Jumpers was often run as a half page with another Cady effort filling the remainder. There were a number of these, including Bunker Blinks, Jungle Jinks, and the earliest comic page appearance of Peter Rabbit. The syndicate and the strip ended sometime in 1914, having run in just a few major papers (Boston Post is one, and they dropped it early on). The syndicate actually produced enough material for a full comics section, but the only paper I've ever found that ran their section in its entirety is the Bellingham (WA) American Reveille. Sadly, the microfilm for this paper includes only a scant few of the comics sections. If anyone knows more about C.J. Mar, Publishers Press, or knows of papers that ran the complete section, I'd love to hear from you. Hello, Allan---The St. Paul Pioneer Press ran the the whole four-page section in early 1913. It's a pre-printed section, on different paper than the rest of the paper, and the SPPP's masthead printed in odd approximation type.---Cole Johnson. Airhead that I am, it took DD Degg to remind me that I have been doing this blog for a year now. My inaugural post was on October 5 2005, so I've already overshot the mark by a bit. The blog has been a lot of work, but it has been more than repaid by your comments, criticisms and information submissions. Your participation is the main reason I do the blog - I love to hear what you folks have to say - both fellow researchers and fans, and the occasional 'outsider' who chances across the site (like the relative of Clare Briggs who just contacted me with a lovely note yesterday). It has also been a wonderful little daily break from what has been a long, hard year for me personally and professionally. Sometimes the hour a day I spend scanning and writing up blog entries may have been the only thing keeping me from going bonkers. So here's to another year of miscellaneous ramblings through the dusty corridors of comic strip history. I hope you'll come along for the ride, and be sure to tell a friend or two. The more the merrier! And to celebrate the anniversary I hereby grant myself a day off. See you on Thursday! That's quite a coincedence. I started the Daily Cartoonist on the same day last year. I didn't find your blog until April of this year (or at least that's when I first mentioned it on my blog). Congratulations! And here's to another great year. I guess the only thing for you to do now, Allan, is give us a complete index of every proper noun that has appeared in you blog for the past year and when it appeared. Alan, that is pretty wild that we started on the same day. Great minds think alike...? I love your Daily Cartoonist blog and check in often. I don't envy you the amount of work it must take to keep it updated every day. Makes me seem like a real piker! As to DD's suggestion that the site be indexed, Blogger does this automatically. There's a search option in the blogger bar at the top of the page. Please hang in there. This page is a must go to destination for me every day. I have very little to comment about on the earlier stuff, but it is interesting and educational. And if I may suggest a subject: I recently came across a couple of sundays for Bob Powell's Teena-a-go-go, a misguided, but nicely drawn feature for Bell-McClure in 1966. I would like to know more about it. Was there a daily version and does anyone have the dates it ran? What's also interesting (Michael Gilbert pointed it out to me) is that it was produced during Will Eisner's tenure at Bell-McClure. He has always stated that he had little succes with developing comic strips and mostly dealt with the columnists, but Bob Powell was his old studio mate...! Was he hiding a disappointment? And what other strips did Bell-McClure start in 1966? Are there more surprises hidden there? Re Teena A Go-Go, a daily supposedly started in June 1966, the Sunday on August 14 1966 (I haven't seen a daily). It seems doubtful that either made it to 1967. The Sunday ran in the Houston Post, and one of these days I'll order the film to see how long it ran there. What dates are your Sundays, Ger? And from what paper? My dates are from november and december 1966, so that would fit. Michael T. Gilbert (who is as much into Powell as I am) didn't know of the feauture, but did have a comic book or magazine reproduction of it, which he thought was the original. At the end of that year Powell fell ill and the strip was abandoned. My copies are from a different paper (which I haven't got with me right now) and I have already looked up a library that has it, to order the film. That's why I needed the dates. The daily will be especially interesting. I am also curious to see how they adjusted to Powell's death. I have a july issue from that same sunday by the way, which doesn't have Teena yet. I can send copies of my four sundays, if you like. How big is your mailbox? Re Teena, you say you have a July Sunday that "doesn't have Teena yet." But it's called Teena A Go-Go?? I'd certainly like to see that Sunday! Also, you and E&P say it was syndicated by Bell-McClure. My Sundays are copyrighted to something called Publication House. Mean anything to you? Michael T. has a strip Powell did for the magazine Teen Life in februari 1966 in a similar style. I googled Publication House and found a copyright notice indicating it was also the publisher of TV Picture Life. So maybe they owned Teen Life as well? In which case they may have been the one to set up the whole teen comic strip thing with Bell-McClure. This post was written in pain. A certain fast food joint (whose logo just might include a red-haired girl) served me a caesar salad today. Said salad was apparently made by an employee who thought those signs in the restroom about washing hands were mere suggestions. So if this post is made in haste my apologies. The porcelain goddess calls (and calls and calls...). Hy Score was one of the new features introduced in the Chicago Tribune Comic Book. In 1940 the Trib inaugurated a new Sunday feature in addition to their regular comic section, a pair of standard newspaper sheets that when folded and cut formed a 16 page "comic book". The new addition was presumably added in response to the burgeoning popularity of newsstand comics. I guess the Trib thought they could connive kids into begging dad to buy the Tribune just because they'd be able to cut apart the funnies to make a little booklet. As unlikely as it seems, I guess the comic book was somewhat of a success because it remained a part of the Tribune for three years. The gimmick had to be what kept it alive, because the contents tended to be less than inspired. 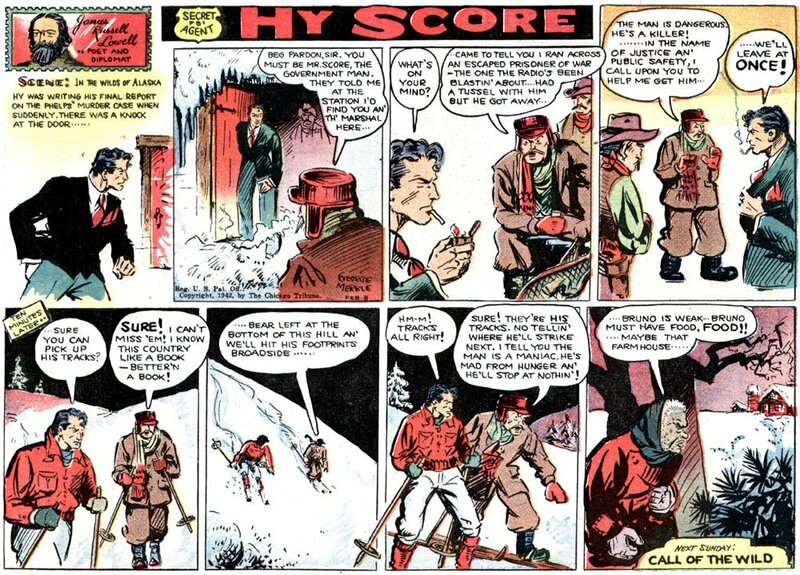 Case in point is Hy Score, which was added to the comic book on June 30 1940. 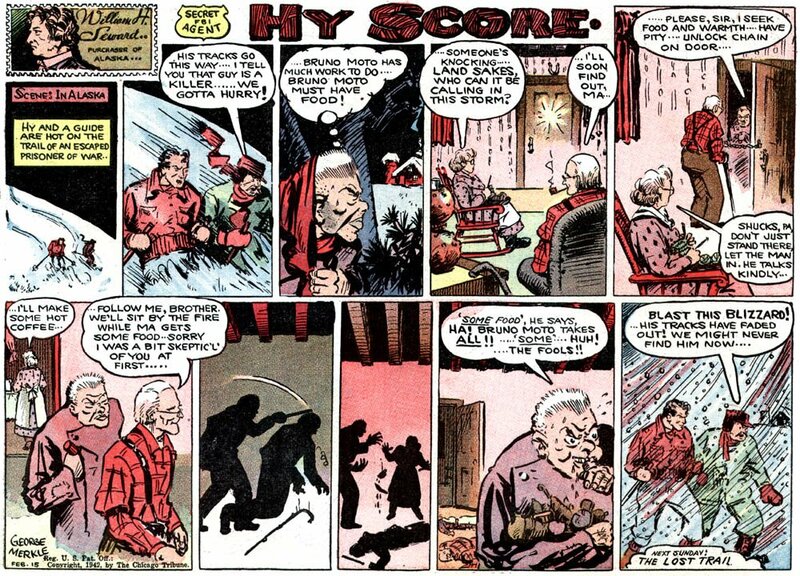 At first this feature was truly awful, with ridiculously text-heavy narratives and exposition laden plots. Mr. Score was an FBI agent who got into all the familiar scrapes of the genre. He solved murder mysteries, foiled espionage, and generally brought all sorts of miscreants to justice. The strip was penned by George Merkle, of whom I know nothing. Merkle's stories improved over the life of the strip, as he slowly but surely pared away at the paragraphs long captions. His art was alright, except that he had a real blind spot (heh) about drawing eyes. Most of his characters run around with eyes firmly shut, and when he did attempt to draw them open you can understand why. Hy Score must have had a little bit of a following, because it actually managed to outlast the Tribune comic book, albeit for just half a year. The strip was put to bed on 10/31/43. And now if you'll excuse me, I must once again call Ralph on the commode-a-phone. According to Jerry Bails "Who's Who of American Comic Books" George Merkle was a pen name for George A. Marko. Marko did comic books from the late 30s to the mid 40s. His comic strip credits include also include something called "Mighty O'Malley" 1947 - 1949. From elsewhere he supposedly did a 1945 comic strip called "Underground". By the way, though it is belated, I want to wish your high entertaining and educational blog a happy one year anniversary and thank you for the effort for the past year. Thanks much DD for the anniversay reminder! As for Merkle, you caught me in the throes of intestinal distress, unable in my delirium to do proper research. Yes, you're absolutely right, Markle did indeed do "Underground". He also did "Stories Stamps Tell" back in 1935. I haven't, however, heard of "Mighty O'Malley". Anyone? This delightful strip had a criminally short run; just a little over two months. 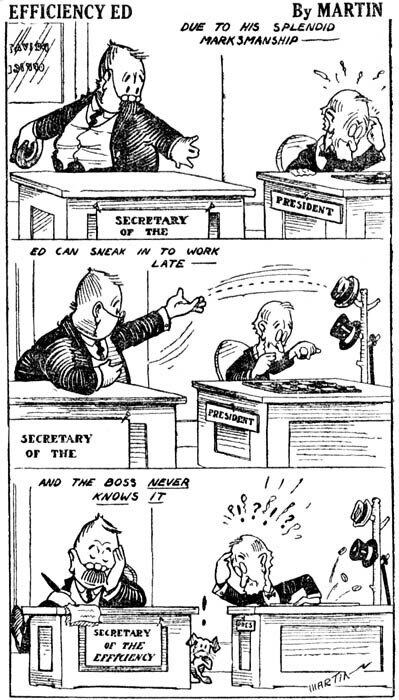 Edgar Martin was still the new kid on the block at NEA when he came up with Efficiency Ed in 1922, two years before he created the classic Boots and her Buddies. 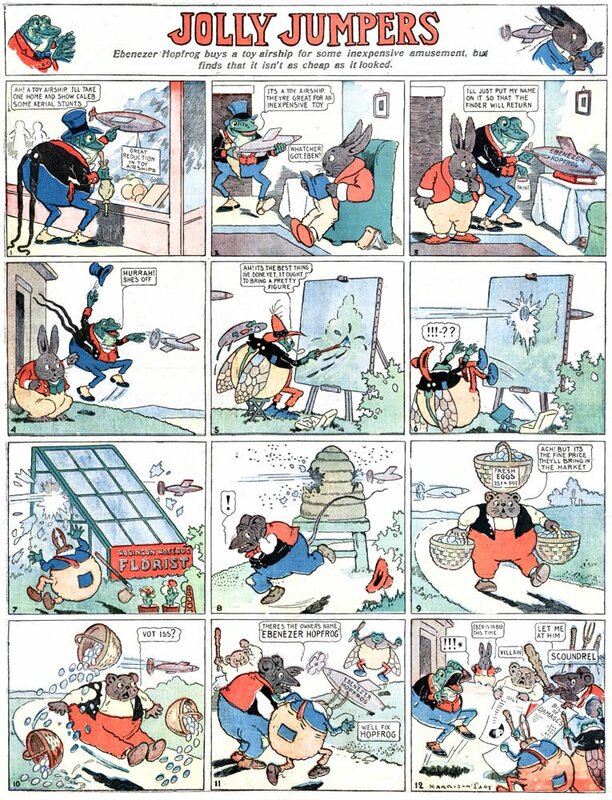 The strip began on January 2nd and ended on March 18th when Martin took over The Nut Brothers from Gene Ahern. The efficiency expert was a new profession, borne of the assembly line. Their jobs were to ensure that production lines moved along as smoothly as possible, with no wasted motion of operator or item being manufactured. The efficiency expert was looked upon with loathing by workers. Not only did the profession seem to dehumanize labor, it was often responsible for eliminating jobs through increased efficiency. Those who were lucky enough to keep their jobs found their labor now quantified with quotas and benchmarks. These systems punished workers for low production, and the reward for higher production was often nothing more than further increased production demands. Most of the humor concerning efficiency expertswas pretty rough stuff since there was no love lost for these individuals. Edgar Martin, however, opted for a softer approach in Efficency Ed. Ed is a pretty loveable fellow, and his desire for efficiency is treated more as a loveable quirk of character than something sinister. Martin makes it obvious that Ed is no real threat when he engages in a long sequence where Ed tries to apply principles of efficiency to catching a mouse in his home. The mouse, of course, outwits him at every turn. I think that Martin could have had a nice long run on this strip if the syndicate had stuck with it.